IFN-κ is a recently identified type I IFN that exhibits both structural and functional homology with the other type I IFN subclasses. In this study, we have investigated the effect of IFN-κ on cells of the innate immune system by comparing cytokine release following treatment of human cells with either IFN-κ or two recombinant IFN subtypes, IFN-β and IFN-α2a. Although IFN-α2a failed to stimulate monocyte cytokine secretion, IFN-κ, like IFN-β, induced the release of several cytokines from both monocytes and dendritic cells, without the requirement of a costimulatory signal. IFN-κ was particularly effective in inhibiting inducible IL-12 release from monocytes. Unlike IFN-β, IFN-κ did not induce release of IFN-γ by PBL. Expression of the IFN-κ mRNA was observed in resting dendritic cells and monocytes, and it was up-regulated by IFN-γ stimulation in monocytes, while IFN-β mRNA was minimally detectable under the same conditions. Monocyte and dendritic cell expression of IFN-κ was also confirmed in vivo in chronic lesions of psoriasis vulgaris and atopic dermatitis. Finally, biosensor-based binding kinetic analysis revealed that IFN-κ, like IFN-β, binds strongly to heparin (Kd: 2.1 nM), suggesting that the cytokine can be retained close to the local site of production. The pattern of cytokines induced by IFN-κ in monocytes, coupled with the unique induction of IFN-κ mRNA by IFN-γ, indicates a potential role for IFN-κ in the regulation of immune cell functions. Type I IFNs are a large family of homologous cytokines conserved in many species, from fish to reptiles to mammals, and were first discovered for their antiviral activity. Subsequently, it was established that they possess a wide range of biological effects including the activation of immune cell populations (1, 2, 3, 4, 5). In humans, 12 different IFN-α proteins, one IFN-β, and one IFN-ω have been identified. Consequently, there is much discussion on the significance of the existence of so many similar cytokines. The main question at issue is whether their activity is redundant or they are characterized by unique functions (6). Studies of the biological effects of natural IFN subtypes have shown that their activities can vary greatly (7, 8, 9, 10). IFN-α8, for example, is the most potent antiviral protein (11), while IFN-β has a higher potency in inhibiting the growth of certain tumors and is used in the treatment of multiple sclerosis (12, 13, 14). We recently reported the identification and preliminary biological characterization of IFN-κ, a 180-aa human cytokine belonging to the type I IFN family (15). The coding sequence of IFN-κ does not have preferential homology with any of the other family members found in humans, displaying ∼30% homology to IFN-α, IFN-β, or IFN-ω. It is characterized by the presence of an additional cysteine at the C terminus following the four conserved cysteines, and by an insertion of 12 amino acids between the C and D region. Alignment of the type I proteins shows that IFN-κ has an overall structure typical of the family. Molecular modeling of the protein displays an organization consisting of five α helices and indicates that two disulfide bonds link the four conserved cysteines as in the other family members. Although the IFN-κ gene is located on the short arm of chromosome 9, where the other type I IFN genes are located, it resides ∼6 Mb away from the cluster, suggesting it evolved separately. A distinguishing feature of IFN-κ is the detectable constitutive expression of its transcript in uninduced cells, particularly keratinocytes (15). The mRNA expression level of IFN-κ can be up-regulated by viral infection, by other type I IFNs and, characteristically, by IFN-γ. IFN-κ binds to the type I IFN receptor complex, and such interaction induces signaling events typical of the other type I IFNs, such as the activation of the IFN-stimulated response elements. The previous study has also demonstrated that IFN-κ can protect human cells of fibroblastic origin from infection with two types of viruses, vesicular stomatitis virus and encephalomyocarditis virus. The current work was undertaken to evaluate the biological effects of IFN-κ on cells of the immune system. In particular, because the protein is up-regulated after viral challenge, we have focused our attention on cells of the innate immunity, which represent the first line of defense in pathological conditions. Recombinant human IFN-κ was expressed and purified from Escherichia coli, as described (15). The endotoxin level in the preparation was <2 EU/mg of protein as determined by the limulus amebocyte lysate method. Recombinant human IFN-α2a and IFN-β purified from E. coli were purchased from PBL Biomedical Laboratories (New Brunswick, NJ); IFN-γ, IL-2, IL-4, and GM-SCF were obtained from PeproTech (Rocky Hill, NJ); LPS, heparin, chondroitin sulfates A, B, and C, and fucoidan were obtained from Sigma-Aldrich (St. Louis, MO). The neutralizing mAbs 23738.111 (anti-IL-10), 1825.121 (anti-TNF-α), and 24822.111 (anti-monocyte chemoattractant protein (MCP)2-1) were purchased from R&D Systems (Minneapolis, MN). The mAbs specific for IFN-κ, 20E07 and 17B09, were generated by the fusion of mouse myeloma cells P3 × 63Ag8.653 with splenocytes from BALB/c mice immunized with rIFN-κ. Monocytes were obtained from human PBMC by centrifugation of leukapheresis preparations (BRT, Baltimore, MD) through Histopaque (Sigma-Aldrich) gradients followed by counterflow centrifugal elutriation. Cell purity was >90%. Cells were cultured in complete medium consisting of RPMI 1640 medium (Life Technologies, Rockville, MD) supplemented with 10% heat-inactivated FBS, 2 mM l-glutamine, and 50 μg/ml gentamicin (Biofluids, Rockville, MD). In some experiments, monocytes were prepared by magnetic beads separation: PBMC were first depleted of plasmacytoid dendritic cells by direct magnetic labeling with anti-bromodichloroacetate-4 mAb-conjugated microbeads and a high-gradient magnetic cell sorting device (MiniMACS; Miltenyi Biotec, Auburn, CA). CD14+ cells were then isolated by two-step immunomagnetic cell sorting (MACS). Monocytes obtained by this procedure were >95% pure. Monocyte-derived dendritic cells were obtained by culturing monocytes for 7–10 days in complete medium supplemented with 1% nonessential amino acids, 1% sodium pyruvate (Biofluids), 5 × 105 M 2-ME (Sigma-Aldrich), 50 ng/ml GM-CSF, and 20 ng/ml IL-4. Over 90% of the cells demonstrated by flow cytometry to express high levels of CD1a and low levels of CD14 and showed characteristic dendrite formations on examination with phase-contrast light microscopy. For measurement of the cytokines TNF-α, IL-10, MCP-1, macrophage-inflammatory protein (MIP)-1α, or IFN-γ, monocytes (1 × 106 cells/ml), dendritic cells (0.5 × 106 cells/ml), or PBL (2 × 106 cells/ml) were cultured for 24 h with complete medium alone or with varying concentrations of IFNs. For measurement of IL-12 production, monocytes were incubated for 18 h with IFN-γ (5 ng/ml) in the presence or absence of varying concentrations of IFNs. LPS (100 ng/ml) was then added and the cells were incubated for an additional 24 h. Cell-free supernatants from the cultures were then harvested and stored at −20°C until use. ELISAs were performed using kits obtained from BioSource International (Camarillo, CA) according to the manufacturer’s instructions. The ELISAs were comprised of a specific capture mAb immobilized on plates, a specific biotinylated Ab as detector, and streptavidin-conjugated peroxidase. Conversion of the substrate by the enzyme was measured at 405 nm. Each value was calculated as the mean ± SE of triplicate samples. Punch skin biopsies were obtained after informed consent from healthy adult volunteers (n = 2), and from adult patients with chronic plaque psoriasis (n = 3) or chronic atopic dermatitis (n = 3). Specimens were embedded in OCT compound, frozen in liquid nitrogen, and stored at −80°C until use. Four-micrometer cryostatic sections were fixed in 5% paraformaldehyde for 5 min, treated with 0.3% hydrogen peroxide to quench endogenous peroxidase activity, incubated with normal horse serum (Vectastain ABC kit; Vector Laboratories, Burlingame, CA) for 20 min, and finally permeabilized with 0.05% Triton X-100. Single staining was performed with mAbs against IFN-κ, 20E07, or 17B09, (5 μg/ml), developed using the avidin-biotin-peroxidase system (Vector Laboratories) and the 3-amino-9-ethylcarbazole substrate and counterstained with hematoxylin. Double immunostaining was performed with the same anti-IFN-κ mAbs and mAbs anti-CD1a (1:20) (BD PharMingen, San Diego, CA), anti-CD14 (1:10), anti-CD3 (BD Biosciences, Mountain View, CA), or anti-FVIII/vWF (1:25) (DAKO, Glostrup, Denmark), using the avidin-biotin-peroxidase or avidin-biotin-alkaline phosphatase system together with the chromogens 3-amino-9-ethylcarbazole and Blue Vector (Vector Laboratories) to reveal the peroxidase and alkaline phosphatase activity, respectively. No counterstain was applied. As negative control, primary mAbs were omitted or replaced with an irrelevant isotype-matched mAb. ELISA microplates (Maxisorp; Nalge Nunc International, Naperville, IL) were coated with heparin-BSA conjugate (Sigma-Aldrich) at 5 μg/ml in bicarbonate buffer (0.05 M sodium bicarbonate, pH 9.5) overnight at 4°C and then blocked for 1 h with 1% BSA (Sigma-Aldrich) in the same buffer. Serial dilutions of IFN-κ (250 ng/ml) were added to the wells in diluent buffer (PBS containing 0.1% Tween 20 and 1% BSA) for 2 h at room temperature. Three sequential steps followed with intervening wash steps with PBS 0.1% Tween. 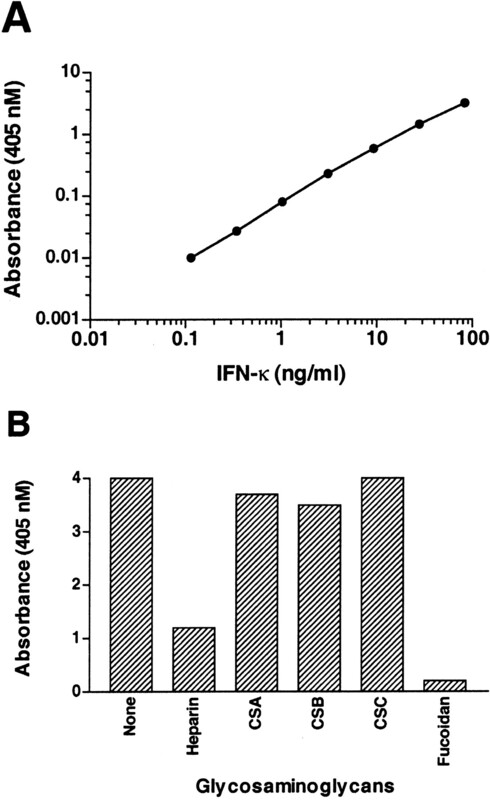 First, detection of bound IFN-κ was achieved by adding an affinity purified biotinylated rabbit polyclonal anti IFN-κ-specific Ab at 0.125 μg/ml for 1 h at room temperature. Peroxidase streptavidin (Vector Laboratories) was then added at a dilution of 1/2000 in diluent buffer for 1 h. Finally, tetramethylbenzidine substrate (Kirkegaard & Perry, Gaithersburg, MD) was added and the incubation was continued for 20 min. Plates were read at 450 nm after stopping the reaction with sulfuric acid. In some experiments, a competitive ELISA was used in which IFN-κ (83.3 ng/ml) was preincubated for 2 h in the absence or presence of varying concentrations of soluble competitors before the addition of the mixture to the heparin-BSA coated plates. The technology uses surface plasmon resonance to measure changes in refractive index when a ligand binds to an immobilized moiety. Heparin-binding kinetic analysis was performed on a BIAcore 3000 (BIAcore, Piscataway, NJ). Two flow cells (high and low density surfaces) of a CM5 chip (BIAcore AB) were activated with a mixture of 0.4 M N-ethyl-N-(3 dimethyl-aminopropyl) carbo-diimide and 0.1 M N-hydroxysuccinimide at pH 8.0, after which streptavidin (Sigma-Aldrich) in 10 mM acetate buffer, pH 5.0, was injected. Unreacted groups were blocked with injection of 1 M ethanolamine at pH 9.0, followed by a single injection of 10 mM HCl. Biotinylated heparin-BSA (Sigma-Aldrich), resuspended in HBS-EP buffer (0.01 M HEPES, 0.15 M NaCl, 3 mM EDTA, and 0.005% surfactant P20, pH 7.4) with 0.2 M NaCl, was flowed over the surface to allow binding onto the streptavidin surface. Both flow cells were then conditioned with two wash steps with 10 mM HCl. The high and low density flow cells had net densities of 1000 and 300 resonance units, respectively. Kd determination was over a low density flow cell (16). For kinetic analysis, IFN test samples were dialyzed in HBS-EP and flowed over a low density surface at 25°C and a flow rate of 15 μl/min. The complexes were washed at 15 μl/min with HBS-EP to study the dissociation phase. The surface was regenerated using 10 mM glycine-HCl, pH 1.5, in the presence of 1.5 M NaCl. Background binding was subtracted by flowing the sample over a blank flow cell. For each IFN subtype, a complete set of sensorgrams was recorded with a series of different concentrations (range = 5–0.31 μg/ml). Sets of sensorgrams were analyzed with BIAevaluation Software, version 3.1 (BIAcore), provided with the instrument. Total RNA (50 ng) was used in a one-step, 50 μl, quantitative RT-PCR. As a control for genomic contamination, parallel reactions were set up without reverse transcriptase. The abundance of specific mRNAs was measured relative to 18S rRNA using the Applied Biosystems Prism 7700 Sequence Detection System. Reactions were conducted at 48°C for 30 min, 95°C for 10 min, followed by 40 cycles of 95°C for 15 s, 60°C for 1 min. Reactions were performed in triplicate. Using Primer Express Software (Applied Biosystems, Foster City, CA), primer and probe sets were designed to target the following human sequences, where the gene named is followed by the sequences of the two primers and then the probes: IFN-κ (GCCCCAAGAGTTTCTGCAATAC, GGCCTGTAGGGACATTTCATAGA, CAACCTATGAAGAGGGACATCAAGAAGGCC); IFN-β (GACATCCCTGAGGAGATTAAGCA,CTGGAGCATCTCATAGATGGTCAA, CAGTTCCAGAAGGAGGACGCCGC); 18S (CGGCTACCACATCCAAGGAA, GCTGGAATTACCGCGGCT, TGCTGGCACCAGACTTGCCCTC). Probes were labeled at the 5′-end with the reporter dye 6-FAM and on the 3′-end with the quencher dye TAMRA (BioSource International). The mRNA level of IFN-κ or IFN-β in each sample, determined in triplicate, are expressed as the mean level and SD relative to the 18S ribosomal RNA level (endogenous reference). The statistical significance of differences among groups was analyzed using the unpaired, two-tailed Mann-Whitney test. The production of cytokines by phagocytic cells at the onset of infections initiates a series of events leading to the activation of the other effector populations of the immune system. In our study, we examined the effect of IFN-κ, IFN-α2a and IFN-β on cytokine release by human monocytes. The other two IFNs were chosen because they are subtypes currently in clinical use (17, 18) and are highly effective in inhibiting viral infection and cell proliferation. Monocytes were purified from peripheral blood and cultured at a concentration of 1 × 106 cells/ml for 1 day in the presence of recombinant IFN-κ, IFN-α2a, or IFN-β (Fig. 1⇓). Both IFN-κ and IFN-β were able to induce release of TNF-α even in the absence of a costimulus, such as IFN-γ that is often required in this experimental system. 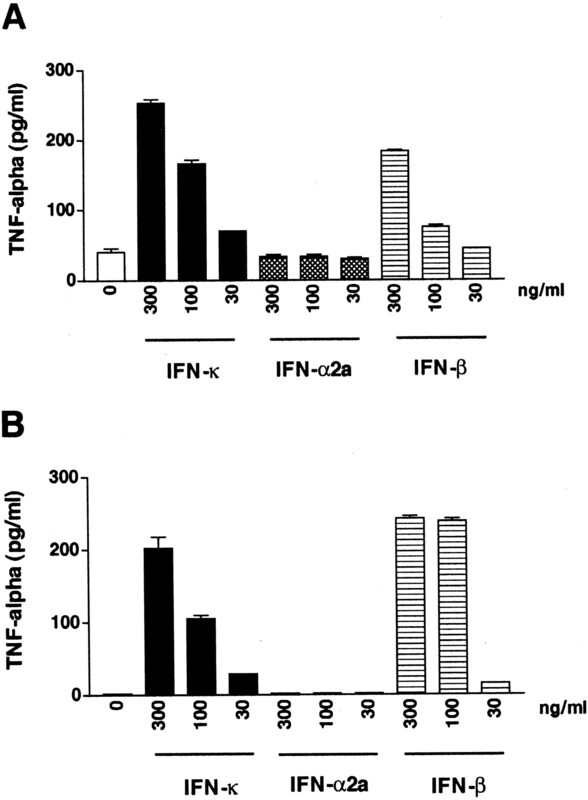 In contrast, IFN-α2a was ineffective in promoting TNF-α release. To avoid that plasmacytoid dendritic cells present in the elutriated monocytes (in average <1%) would account for the observed cytokine release, in several experiments monocytes were purified using magnetic separation. Plasmacytoid dendritic cells were first completely removed from the PBMC using blood dendritic cell Ag-4 mAb-conjugated microbeads (19) followed by immunomagnetic enrichment of CD14+ cells. The resulting cell preparations (>95% monocytes) released TNF-α following stimulation with IFN-κ and IFN-β, as observed with the donor reported in Fig. 1⇓B. Cytokine release following IFN-κ incubation was consistently observed in all donors tested (n = 10); however, the concentration of cytokine detected in the conditioned media was donor-dependent. For example, following treatment with 100 ng/ml, cells from the donors reported in Figs. 1⇓A and 2A released 166 and 423 ng/ml of TNF-α, respectively. 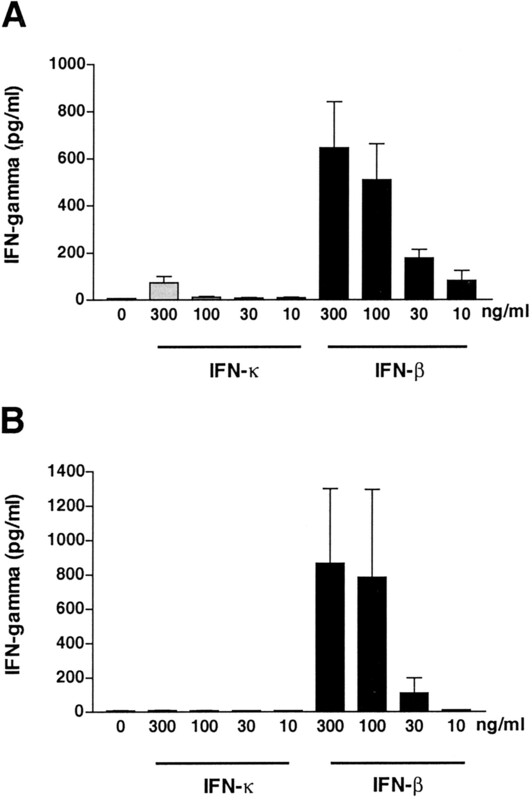 IFN-κ strongly synergized with IFN-γ to stimulate TNF-α release when the two factors were simultaneously added to the cultures (Fig. 2⇓B). In contrast, IFN-κ did not increase LPS-induced cytokine release (Fig. 2⇓C). Chemokines, such as MCP-1 and MIP-1α, were found to be up-regulated in IFN-κ-stimulated monocytes (Table I⇓). Interestingly, IL-10 production was strongly induced by the novel IFN, with an increase up to 40-fold. Induction by IFN-κ of TNF-α release from monocytes. 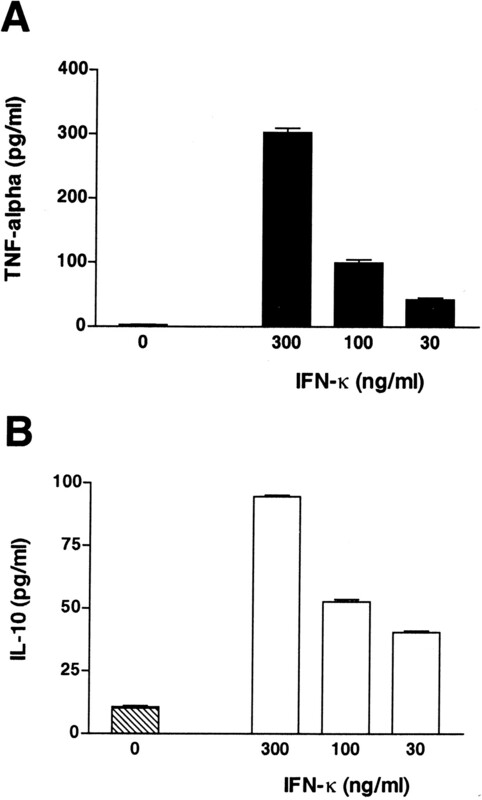 Monocytes were treated with varying concentrations of IFN-κ, IFN-α2a, or IFN-β (ng/ml) for 1 day; conditioned media were collected and assayed for TNF-α content by ELISA. A, Monocytes from healthy donors were purified by centrifugal elutriation; representative experiment (one donor of seven). B, Monocytes were purified by magnetic separation; representative experiment (one donor of three). Synergistic effect of IFN-γ on IFN-κ-induced TNF-α release from monocytes. Monocytes were treated with IFN-κ (ng/ml) alone or in combination with IFN-γ (5 ng/ml) or LPS (100 ng/ml). TNF-α content in the media, conditioned for 24 h, was analyzed by ELISA. One representative experiment is shown (one of three). Among cytokines produced by monocytes, IL-12 plays an important role in immunoregulation, being an inducer of IFN-γ and a generator of Th1 T cell responses. IL-12 production is therefore normally tightly regulated. The ability of IFN-κ to modulate its release was examined. To obtain release of IL-12 from human monocytes, the stimulation protocol described by Hayes et al. (20) was used. Freshly isolated monocytes were cultured overnight with IFN-γ in the presence of either IFN-β or IFN-κ, with LPS then added to the cultures for an additional 24 h. In the donor reported in Fig. 3⇓A, cell stimulation induced the release of 2231 pg/ml of IL-12, which was inhibited by IFN-κ in a concentration-dependent manner. A consistent pattern of inhibition of inducible IL-12 release was observed in all the donors (n = 7), and the level of reduction observed with IFN-κ was greater than that observed with IFN-β. 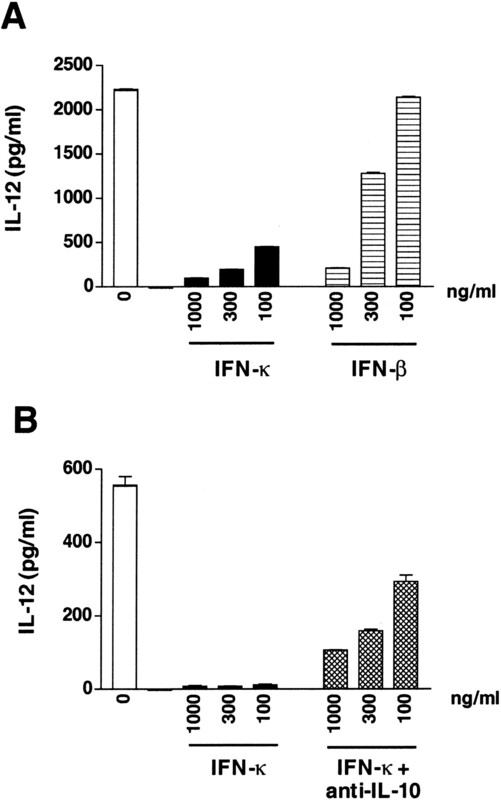 Inhibition by IFN-κ of IL-12 release from monocytes. A, Comparison of the effect of IFN-κ and IFN-β. Human monocytes were treated with IFN-γ (5 ng/ml) and with IFN-κ or IFN-β (ng/ml). After 16 h of incubation, cells were stimulated by the addition of LPS (100 ng/ml). Following additional 24 h in culture, conditioned media were collected and assayed for IL-12 content by ELISA. A representative experiment (one of seven) is shown. B, IFN-κ-induced inhibition is IL-10-dependent. The neutralizing anti-IL-10 mAb 23738.111 (1 μg/ml) was added to the cultures together with the IFNs. One representative experiments is shown (one of three). The ability of IFN-κ treatment to suppress IL-12 release is dependent on IL-10 release because it could be blocked by an IL-10-specific mAb (Fig. 3⇑B and Table II⇓). To determine whether other cytokines produced by monocytes, such as TNF-α or MCP-1, participate in the observed inhibitory activity (21, 22), neutralizing mAbs against TNF-α or MCP-1 were added to the experimental system (Table II⇓). Anti-IL-10 mAb completely abolished the inhibitory effect of 10 ng/ml IFN-κ and partially inhibited the effect of 100 ng/ml. Anti-TNF-α or MCP-1 mAbs partially blocked the inhibitory effect of 10 ng/ml IFN-κ, but did not have any effect in neutralizing the activity of 100 ng/ml IFN-κ. When the neutralizing mAbs against TNF-α and MCP-1 were used together with the anti-IL-10 mAb to block the activity of 100 ng/ml IFN-κ, no additive neutralizing effect was observed. IFN-κ activity was then analyzed on dendritic cells. As with monocytes, a direct stimulation of cytokine release was mediated by IFN-κ (Fig. 4⇓). Significant levels of TNF-α and IL-10 were detected in the supernatants following culture for 1 day. In addition, IFN-κ, like IFN-β, enhanced the expression of Ags correlated with activation and increased Ag-presenting capacity, such as MHC class II and CD54 (data not shown). Contrary to the experiments with monocytes, we did not observe inhibition of IL-12 production from LPS-stimulated dendritic cells (data not shown). Interestingly, McRae et al. (23) have reported that, on dendritic cells, type I IFNs inhibited IL-12 production induced by CD40 ligation, but not by LPS stimulation. Induction by IFN-κ of cytokine release from dendritic cells. Dendritic cells (5 × 105/ml) were treated for 1 day with IFN-κ. Conditioned media were collected and assayed for TNF-α or IL-10 content by ELISA. Representative experiment of four. Having established a modulatory activity of IFN-κ on cytokine release in monocytes, we explored the effect of type I IFNs on IFN-γ release from PBL (Fig. 5⇓A). In four donors, IFN-β induced a strong dose-dependent release of IFN-γ, while IFN-κ produced a minimal effect only at 300 ng/ml (p < 0.001 IFN-β vs IFN-κ treatment). To define the population responsible for the release of IFN-γ following stimulation with the two type I IFNs, PBL from four additional donors were depleted of T cells using CD3-conjugated magnetic beads (following separation, T cell content <2%, NK content >30%). The resulting cell populations enriched for NK cells were stimulated with IFN-β or IFN-κ. 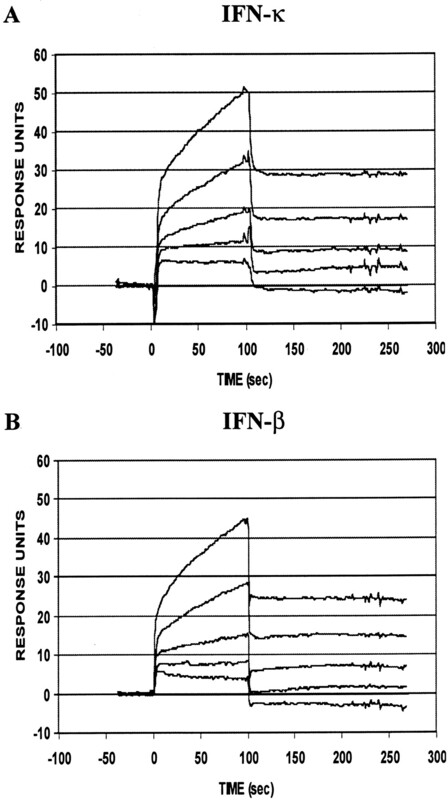 As observed in the previous experiments, IFN-β strongly induced IFN-γ release and IFN-κ did not have effect (Fig. 5⇓B). However, IFN-κ was able to increase NK cytotoxic activity of PBL, although at a lower level than IFN-β or IFN-α2a (not shown). Effect of IFN-κ on IFN-γ release. A, Release from total PBL; B, release from PBL depleted of T cells. Cells were treated for 20 h with varying concentrations of IFN-κ or IFN-β. Culture supernatants were collected and assayed in IFN-γ-specific ELISA. In each graph, bars represent means ± SD of four independent experiments. Previously, we demonstrated that the IFN-κ mRNA is present in unstimulated keratinocytes and is inducible by stimulation with a variety of factors, including type I and type II IFNs (15). The aim of the next series of experiments was to determine whether IFN-γ could also up-regulate IFN-κ expression in monocytes, known to be a source of IFN-αβ following viral or bacterial challenge. Quantitative PCR analysis was conducted with mRNA from peripheral blood monocytes, freshly purified or following treatment with IFN-γ. As shown in Fig. 6⇓A, donor no. 1 and no. 2, IFN-κ mRNA was found in resting monocytes (expression ratios, relative to 18S RNA, 1.1 and 1.9 × 10−5 respectively). Transcript concentrations were enhanced by treatment with IFN-γ and the increase was dependent on the time of incubation with the cytokine reaching a maximum level at 12–24 h. At 48 h of stimulation, mRNA expression declined to the level found in unstimulated cells. The up-regulation observed was IFN-κ-specific because very low levels of IFN-β mRNA were observed in the monocytes, resting or IFN-γ-stimulated. Plasmacytoid dendritic cells, also called type 2 predendritic cells or plasmacytoid T cells, constitute a subset of immature dendritic cells present in very low numbers in human peripheral blood and have the capacity of producing a large amount of IFN-αβ in response to viral stimulation. To eliminate the possibility that the minimal contamination of plasmacytoid dendritic cells in the elutriated monocytes could account, at least partially, for the IFN-κ transcript, monocytes were also prepared by immunomagnetic cell sorting. PBMC were completely depleted of BDCA-2+ cells (24) and then were positively selected for CD14 binding. Monocytes obtained from three donors showed constitutive levels of IFN-κ (mean expression ratio = 2.7 × 10−5 ± 1.8) and it was inducible by IFN-γ treatment. A representative donor (donor no. 3) is shown in Fig. 6⇓A. IFN-κ mRNA levels in myeloid cells. A, Expression in monocytes, untreated or IFN-γ-treated. Peripheral blood monocytes purified by elutriation (donor no. 1 and no. 2) or by immunomagnetic cell sorting (donor no. 3) were incubated for increasing lengths of time with 5 ng/ml IFN-γ (p < 0.005, IFN-γ-treated vs untreated monocytes at 24-h time point). B, Expression in monocyte-derived dendritic cells. The mRNA levels of IFN-κ (▪) or IFN-β (□) in each sample were determined by quantitative RT-PCR in triplicates, as reported in Materials and Methods, with the mean level of and SD expressed relative to the 18S ribosomal RNA level. IFN-κ mRNA was also found in monocyte-derived dendritic cells (mean expression ratio = 4.6 × 10−5 ± 2.2 in four donors), while IFN-β mRNA was minimally detectable (mean expression ratio = 0.3 × 10−5 ± 0.3) in two of four donors (Fig. 6⇑B). However, in this cell type treatment with IFN-γ did not significantly enhance the level of the transcript (not shown). To test whether IFN-κ is expressed in vivo at inflammatory sites rich in monocytes and dendritic cells, skin lesions from patients with psoriasis or atopic dermatitis were assayed for IFN-κ immunoreactivity. Normal skin from healthy subjects showed only scattered IFN-κ-positive cells in the dermis (Fig. 7⇓A). In contrast, numerous IFN-κ-positive cells were observed in sections from psoriasis and atopic dermatitis, in both the epidermis and dermis (Fig. 7⇓, B and C). In particular, double-staining showed that the cells expressing IFN-κ were mostly CD14+ monocytes and part of CD1a+ dendritic cells in both diseases (Fig. 7⇓, D and E, and G and H). IFN-κ was also expressed by basal and suprabasal keratinocytes, with the positivity localized along the cell membrane of these cells, in their cytoplasm and in the intercellular spaces. Finally, anti-IFN-κ mAb reacted with the majority of FVIII+ venules localized in both the superficial and reticular dermis but not with CD3+ T lymphocytes (Fig. 7⇓, F and I). In vivo detection of IFN-κ in inflamed human skin. Single-staining for IFN-κ (red) was performed on normal skin (A) and psoriatic (B) or atopic dermatitis (C) lesions. Double-staining shows that cells positive for IFN-κ (red) are CD1a+ dendritic cells (blue) (D and E, psoriasis and atopic dermatitis, respectively) and CD14+ monocytes (blue) (G and H, psoriasis and atopic dermatitis, respectively). Anti-IFN-κ Ab also stains most of the FVIII+ dermal microvessels (I) but not CD3+ T lymphocytes (F) (blue) in psoriatic skin. A membrane and cytoplasmic immunoreactivity for IFN-κ is also present in basal and suprabasal keratinocytes. Arrows in D and E and G and H indicate the IFN-κ/CD1a and IFN-κ/CD14 double-positive cells, respectively; representative experiment shown. The staining and number of donors are as reported in Materials and Methods. The intriguing observation of IFN-κ constitutive expression in keratinocytes (15) suggests that this IFN may have a local function in the epidermis. To determine whether IFN-κ can be retained at its site of production through interaction with the glycosaminoglycans present in many tissues, we developed an ELISA-based assay to measure IFN-κ binding to heparin. As shown in Fig. 8⇓A, dose-dependent binding of IFN-κ to the heparin-BSA complex was observed. The binding is detected with high sensitivity because it was readily observed with as little as 1 ng of IFN-κ. In competition experiments, heparin and fucoidan, a nonmammalian polysaccharide, strongly inhibited interaction, while chondroitin sulfate A and B were very weak inhibitors, and chondroitin sulfate C was ineffective (Fig. 8⇓B). Surface plasmon resonance (BIAcore analysis) allowed the determination of the affinity binding. Biotinylated heparin-BSA was immobilized on a streptavidin-activated sensor chip and then IFN-κ was injected over the heparin-BSA surface. A typical sensorgram was obtained (Fig. 9⇓A) with an association phase and, when IFN-κ was replaced by running buffer alone, a dissociation phase. Similar sensorgrams were obtained with IFN-β (Fig. 9⇓B) and IFN-γ (not shown). The heparin-binding affinity values of the two type I IFNs were similar: 2.1 nM and 1.4 nM for IFN-κ and IFN-β, respectively. On the contrary, IFN-α2a showed a minimal binding to heparin (not shown). The affinity value for IFN-γ, 1.1 nM, was within the range of previously published results (25). IFN-κ is a heparin-binding protein. A, Binding of rIFN-κ to immobilized heparin-BSA complex. Increasing concentrations of IFN-κ were added to ELISA plate wells coated with 5 μg/ml heparin-BSA; binding was detected by biotinylated rabbit polyclonal anti-IFN-κ Ab. B, Inhibition of binding by glycosaminoglycans. Before addition to the heparin-BSA-coated plate, IFN-κ was incubated in absence or presence of 1 μg/ml heparin, chondroitin sulfate A (CSA), chondroitin sulfate B (CSB), chondroitin sulfate C (CSC), or fucoidan. Absorbance was measured after a 20-min incubation with substrate. The experiment was performed twice with similar results. BIAcore analysis of type I IFN binding to immobilized heparin. The sensorgrams show the on- and off-rate regions of varying concentrations of IFN-κ (A) or IFN-β (B), as described in Material and Methods. The binding response in resonance units was recorded as a function of the time. Kd values were calculated using the BIAevaluation kinetic software program. The experiment was performed twice with similar results. In summary, we have established for the first time, to our knowledge, that two type I IFNs, IFN-β and IFN-κ, are heparin-binding proteins. IFN-κ binding is specific because no interaction with other glycosaminoglycans, such as chondroitin sulfate C, was observed. The strong competing effect of fucoidan was observed also in other studies of heparin-binding proteins and is believed to be due to the highly sulfated and branched structure of the polymer (26). In this study, we have extended the biological characterization of IFN-κ, a newly identified subclass of human type I IFN. The functional profile of the cytokine resembles that of IFN-β more than that of IFN-α2a, one of the IFN-α subclasses. Like IFN-β but in contrast to IFN-α2a, IFN-κ is able to directly modulate cytokine release from monocytes and dendritic cells, and to strongly bind heparin. However, IFN-κ did not stimulate IFN-γ release from NK cells. Two distinct receptor subunits for type I IFNs have been identified, IFN-α receptor (IFNAR)-1 and IFNAR-2 (reviewed in Refs. 27 and 28). IFNAR-1 has an important role in signal transduction, whereas IFNAR-2 seems to be the major ligand-binding component. Although all the type I proteins, including IFN-κ (15), bind to the same receptor complex, there is much experimental evidence demonstrating that the interactions with the receptor or the induction of signaling pathways can vary, thus influencing the biological responses (9, 29, 30, 31, 32). The large differences observed in the immunological activities of IFN subspecies are suggestive of specific functions characterizing the different cytokines (7). Our results indicate that IFN-α2a does not have the same modulatory activity on monocytes that IFN-κ and IFN-β do. In addition, the effect of IFN-κ on monocytes, qualitatively similar to that of IFN-β, raises the possibility that this novel IFN shares with IFN-β the binding sites and/or the signaling pathways regulating the monocytic response. Of particular interest is the ability of IFN-κ to mediate a strong increase in IL-10 release and a concomitant inhibition of inducible IL-12 release. The decrease in IL-12 level was found to be IL-10-dependent, as demonstrated by the blocking activity of an IL-10-neutralizing Ab. There are conflicting reports of the role of type I IFNs on IL-12 production. IFN-α and IFN-β were found to increase IL-12 mRNA in human macrophages (4) and up-regulate the expression of the IL-12R β2 chain in CD4+ T cells (33). However in other studies, type I IFNs suppressed IL-12 production in a mixed leukocyte population and in dendritic cells (23, 34). Further support for an inhibitory role of class I IFNs comes from in vivo studies. In virally infected mice, endogenously expressed IFN-αβ inhibited the ability of LPS to induce IL-12, while neutralization of IFN-αβ enhanced IL-12 and IFN-γ production (34). Lastly, Wang et al. (35) demonstrated that IFN-β inhibits IL-12 production in Staphylococcus aureus Cowan- plus IFN-γ-stimulated human PBMC in an IL-10-dependent mechanism. In this study, the authors did not observe enhancement by IFN-β of basal IL-10 production in monocytes and suggested that the IFN-β effect was mediated by inhibition of IFN-γ priming. In our experiments, IFN-κ directly induced IL-10 release from monocytes in the absence of other stimulatory factors, such as LPS/S. aureus Cowan or IFN-γ. Our findings suggest a potential therapeutic use of IFN-κ for autoimmune disorders in which the pathogenesis is linked to an overproduction of IL-12, including multiple sclerosis, rheumatoid arthritis, insulin-dependent diabetes, and experimental colitis. It has been shown that decreased levels of IL-10 and increased IL-12 mRNA in cells of multiple sclerosis patients are associated with disease progression (36). IFN-β is, indeed, an approved therapy for this disease and was found able to slow disease progression and reduce relapses (13, 14). IFN-κ might also be beneficial in the treatment of inflammatory syndromes, such as sepsis, where IL-10 plays a down-regulatory role and IL-12 has the opposing effect (37, 38). These potential therapeutic indications are further supported by the very low stimulatory effect of IFN-κ on IFN-γ release from PBMC. 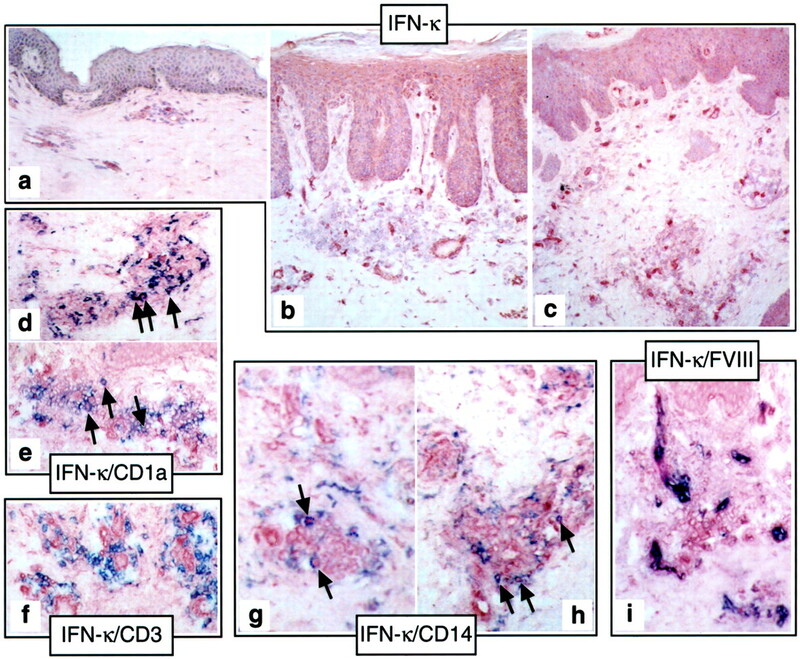 IFN-γ is a principal player in the regulation of both autoimmune and inflammatory disorders, thus a low level of IFN-γ secretion might benefit such disease states. Another interesting characteristic of IFN-κ, shared with IFN-β, is the high-affinity interaction with heparin. Numerous growth factors, chemokines, and cytokines bind to heparin or heparan sulfates, including IFN-γ, TGFβ-1, IL-8, IL-2, the p40 subunit of IL-12, and IL-10 (25, 39, 40, 41, 42, 43). Due to the highly acidic property of heparin, it is believed that clusters of basic amino acids in the cytokine sequences promote the interaction with glycosaminoglycans (44). The sequence of IFN-κ does not display clusters of arginines and lysines in the primary sequence. However, it is possible that the folding of the protein in the secondary structure brings into proximity discontinuous basic residues. For example, a single amino acid mutation in the sequence of MIP-1β abolished the glycosaminoglycan binding activity of the chemokine (45). The binding of the two cytokines, IFN-κ and IFN-β, to polysaccharides is likely to keep them close to the production site and to stimulate antiviral and immune responses focused at the local site of infection. A distinct property of IFN-κ is that its transcript is readily induced by type II IFN. Monocytic cells are among the main producers of type I IFNs following viral challenge or stimulation with bacterial endotoxin. Although secretion of IFN-β was observed in murine peritoneal macrophages treated with IFN-γ (46), it was shown that freshly isolated human monocytes did not produce type I IFNs in response to single IFN-γ or LPS stimulation, but needed to be primed by either IFN-γ or GM-CSF (47). In agreement with these results, we have demonstrated by quantitative RT-PCR analysis that human monocytes and dendritic cells have a very low or undetectable level of IFN-β mRNA that is not inducible by IFN-γ treatment alone. On the contrary, a significantly higher constitutive level of IFN-κ mRNA was observed in the cells. Moreover, the expression was inducible in monocytes by IFN-γ treatment. The presence of IFN-κ in monocytes and dendritic cells was confirmed in vivo in the skin affected by psoriasis or atopic dermatitis. In conclusion, our findings suggest that IFN-κ may play a role in the regulation of systemic or local immune functions through its effect on cells of the innate immune system. The enhancement of IFN-κ expression by IFN-γ could be a negative feedback mechanism to suppress further activation of T lymphocytes and NK cells via enhancement of IL-10 and inhibition of IL-12 release in accessory cells. To completely define the function of IFN-κ in the immune system, the effect of this cytokine on the cells regulating adaptive immunity needs to be characterized. We thank Drs. Tim A. Coleman and Guoxian Chen for providing the recombinant IFN-κ and Dr. Viktor Roschke for providing the mAbs anti-IFN-κ. We thank Tatiana Tsareva, Don Mather, and Victor Kao for technical help. ↵2 Abbreviations used in this paper: MCP, monocyte chemoattractant protein; MIP, macrophage-inflammatory protein; IFNAR, IFN-α receptor.